If you thought Book 1 Between the Bleeding Willows was great you haven't read nothing yet. 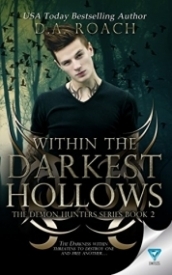 Within the Darkest Hollows is mostly about Tyler and his connection to Rya and boy did this series take a turn with him. Cassidy gets taken to the Demon Realm and Tyler goes to save her only to be injured and finally have his Demon side let loose. i really love Killian but Tyler has a place in my heart also. i really liked reading about him. I kinda laughed at how Tyler got his wings. The Demon Tyler is appealing for some odd reason but cant wait to see it he can bury it or get rid of it in the next book. Another amazing book in this series! These definitely need to be read in order to be enjoyed and understood. I loved that this book was a bit darker and had lots more drama and conflict. I like that the characters were able to grow in this one and show more depth. Cassidy was put through the ringer. And I loved that we learned more about Tyler and what his role is in this world. I'm super excited to see what comes next and would definitely recommend this one for fans of YA paranormal.